We recently gave a thorough wedding dress cleaning to this darling Maggie Sottero wedding gown made of a lovely soft, satin with appliques of crystals and bead work over tulle on bodice and both sides of dress. Ah, but the bride had a great time at her wedding, as the hemline was quite dirty, and there were spills and food stains on several parts of skirt. 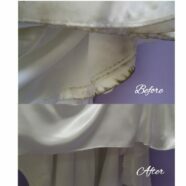 Nevertheless, we were able to give it a through cleaning and preserve it with our Museum Method™ wedding dress preservation. This bride’s daughter will cherish this beautiful wedding gown.